An annual Toronto tradition since 1913. The advent of lieutenant-governors at the head table in 1963. Celebrating a host of multicultural holidays. The makeup of this year’s Christmas luncheon head table. 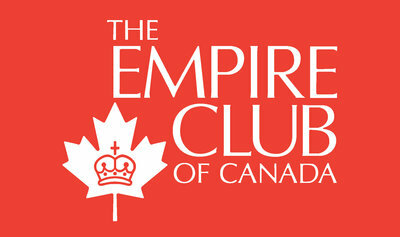 Looking forward to the presentation of this year’s Empire Club Community Service Award. What the speaker hopes to achieve in his new role. The issue of accessibility. Some figures from Statistics Canada. Some words from Charles Dickens. Her Honour Ruth Ann Onley: International Christian Recording Artist. It is now my pleasure to introduce the 28th Lieutenant-Governor of Ontario, the Honourable David C. Onley. The Honourable David C. Onley took office on September 5, 2007 as Ontario’s 28th Lieutenant-Governor. Born in Midland, Ontario, His Honour attended local schools and graduated from the University of Toronto in 1975 with an Honours Bachelor of Arts and Political Science. He worked as an intern at Queen’s Park and attended the University of Windsor Law School. His Honour has championed disability issues on many fronts and for many years. Having lived with polio and post-polio syndrome since the age of three, he has broken through social barriers and become a role model for many people. In his 22-year career with Citytv His Honour was Canada’s first senior newscaster with a visible disability. A popular news anchor, host producer, science and technology specialist and weatherman, he showed that ability outshines disability. His Honour has chaired the Government of Ontario’s Accessibility Standards Advisory Council, served on the Skydome Accessibility Council, and the Air Canada Centre Accessibility Committee. For his public service His Honour has been presented with the King Clancy Award for disabled persons, the Courage to Come Back Award and the Positive Impact Award. He was inducted into the Terry Fox Hall of Fame and the Scarborough Walk of Fame and received an Honorary Doctor of Laws degree from Canada Christian College. His best selling novel “Shuttle” was nominated as Book of the Year in 1982 by the Periodical Distributors Association. He co-founded and was President of the Aerospace Heritage Foundation. Ladies and gentlemen, the Honourable David C.Onley, Lieutenant-Governor of Ontario. Ms. Swift, distinguished guests, ladies and gentlemen: I’m told that the Empire Club Christmas luncheon is a Toronto tradition that has taken place every year since 1913. I was also interested to learn that it was not until 1963 that lieutenant-governors became part of the head table. I’m not sure who considered whom the riff-raff. I do know that I am very happy to join you in this special season, when communities across Ontario gather to celebrate a host of multicultural holidays, including Eid al-Fitr, Hanukkah, Kwanzaa, and Christmas. Whatever you call it, I think you will agree with a man called Hamilton Wright Mabie, who said: “Blessed is the season which engages the whole world in a conspiracy of love.” And nowhere is that conspiracy more apparent than in the makeup of this year’s Christmas luncheon head table. I am humbled to find myself in the company of so many charitable organizations, and individuals who are doing so much for the less fortunate in our community. I look forward to presenting this year’s Empire Club Community Service Award to one of those individuals, Fred Gaby. I know that it is usual for the lieutenant-governor to come here every year and give you a report, as it were, on what he or she has been up to since the last Christmas luncheon. Because I am relatively new in the position, I hope you will forgive me if, instead, I tell you something about what I hope to achieve in my new role. As Ontario’s first lieutenant-governor with a physical disability, the issue of accessibility is very close to my heart, and I have made it the over-arching theme of my mandate as lieutenant-governor. By accessibility, I mean more than curb cuts, widened entrances, and white wheelchairs on a blue sign. By accessibility, I mean inclusion in the political, economic, cultural, and social life of this province. By accessibility, I mean that which enables people to achieve their full potential. The latest figures from Statistics Canada inform us that there are more than 1.8 million disabled Ontarians, just over 15.5 per cent of the population. Over the next five years, I look forward to engaging in a dialogue with Ontarians about the challenges and achievements of people with disabilities. I have already had the opportunity to speak to many entrepreneurs and business people on the topic of hiring employees who also happen to have disabilities, and I have been encouraged by the willingness of so many of them to look beyond disability to hireability. I wish you all the very best of this blessed season, and a very happy New Year. In the name of the Queen, I send special greetings to the men and women of Canada’s military forces serving in Afghanistan and around the world, and to your families here at home. I want you to know that the thoughts and prayers of every Canadian are with you. God bless. Thank you. The appreciation of the meeting was expressed by Gareth Seltzer, Past President, The Empire Club of Canada.